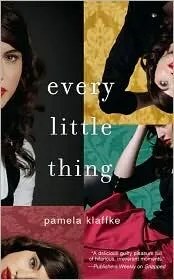 Book Review "Every Little Thing"
I received an ARC-EBook Bound galley Edition from NetGalley, at no cost to me, for my honest opinion. Synopsis (borrowed from NetGalley): If it’s not one thing, it’s her mother. Before there were mommy bloggers, there was Britt. San Francisco’s brassy scandal queen filled her newspaper column with juicy details of her many marriages, cosmetic surgeries and everything about her only daughter, Mason. Then Britt dies. Suddenly and in spectacularly embarrassing fashion. So Mason-now thirty-five and vehemently un-Britt-like in every way-returns home to settle her affairs…though some affairs are not so easy to settle. Now caught in her own sordid debacle, Mason finds herself thrust back into the spotlight, and this time it’s her own doing. Struggling to define herself as anything other than Britt Junior, Mason soon discovers that Britt’s intensely public life still held some secrets. And though the overgrown teen rebel has always favored combat boots, she may yet walk a mile in her mother’s shoes. My Thoughts and Opinion: After reading the above synopsis, I thought this would be a perfect match for me to read. It was categorized as a humorous adult read and I assumed it was also going to be a “chick lit” book. When I first started accepting requests, I would read a minimum of 100 pages to decide if a book would go into a DNF pile, until an author and I had a discussion about my policy. He told me that a reader should be pulled into the story line a lot sooner than 100 pages so I changed my policy to 50 pages. I was very much looking forward to reading this book after have just completing a few in the mystery genre. However, to much disappointment, I struggled even to get to page 50. It was not at all what I thought it was going to be. For 50 pages, I was searching for what the plot was because all I was reading about were 5 adults, that were in their late twenties early thirties, and related by being step brothers and/or sisters. And in those first 50 pages what I did learn of these 5 adults was that they enjoyed drinking, where they were drinking and what they were drinking and what their actions were from drinking. Unfortunately, this book had to go in the DNF pile. It was not a book for me. Maybe if I had my old “Review Policy” of 100 pages, I would have been pulled into the story line, but the 50 page limit did not grab me. Or then maybe it is because I am not a twenty or thirty something and will leave it at that! Yuk – in 50 pages you should by rights get more plot than just people drinking. Such a disappointment! sorry to hear this book didn't work out for you, as it does sound good. But I also feel like 50 pages is not enough unless you hate it, sometimes it might not be the right mood. It is nice to know this book is not as good as the cover looks. The cover caught my eye, and I thought, that looks like something that I would like. Thanks for the honest review.